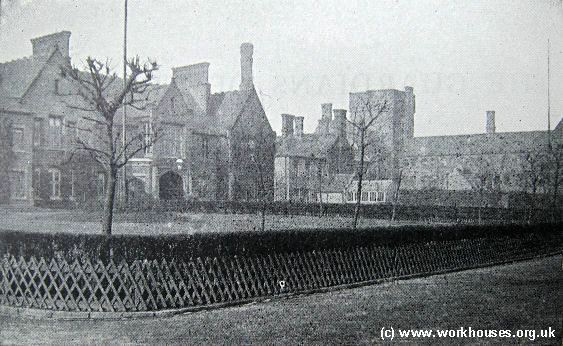 A photo of the workhouse before it was surrounded by a car park for the City Hospital visitors ). If you have a better one please share it with us. Birmingham Conservation Trust have secured funding to carry out an Options Appraisal on the Archway of Tears at the City Hospital on Dudley Road. This is the initial stage in a proposed larger project to restore the Archway of Tears - the entrance to the former Birmingham Union Workhouse. The building was designed by J.J. Bateman and completed in 1852. 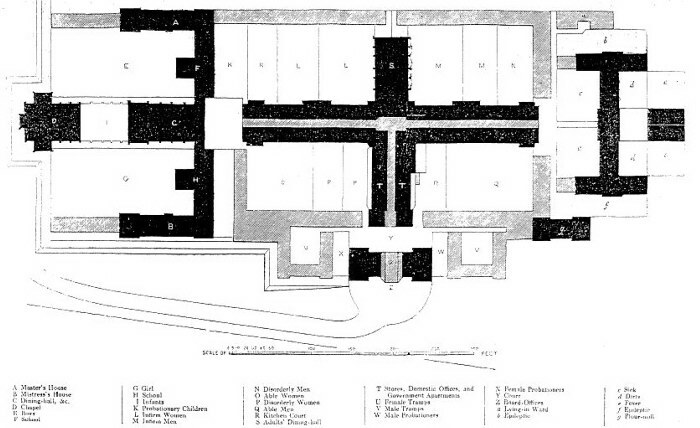 It was here that people driven by poverty and circumstance arrived to be assessed for entry to the workhouse. Its evocative name reflects the sorrow suffered by new arrivals as families were split by gender and age to relevant living and working areas. We will look at ways to re-use the building in a sustainable way and we also will tell the story of the Workhouse in some way. If you or your family have any memories or artefacts you want to share with us, please get in touch. Please see attached photo from left to right my Mum's brother Joey, her sister Maureen, her youngest brother Norman and My Mum the eldest of the Bannon children Pat, her married name was Maher. My Mum and her family ended up in the workhouse when her father Joseph Bannon left her mother Rose, he was a bigamist and married a woman in Wales and had another family who I have since traced, the other family didn't know of the existence of my Mum and her brothers and sister. My nan Rose went out to work and left my mum who was 8 looking after the other 3 children her brother Joe scalded himself and the family ended up in the workhouse before the children were placed in homes. Mum and her sister went to Father Hudson's and her younger brothers ended up in Erdington cottage homes. My Mum told me she had her first egg in the homes and ate the shell, she left the homes first because a friend of my Nan's Mary Harris took her in, she basically ended up fetching and carrying for them,her sister joined her at Mary's. Mum got pregnant with me at 18 and married my Dad who was 6 months younger, they had to go to Ireland to get permission to marry from his mother and father because they were under 21. Mum lived in Ausley St. Aston for 12 months with my grandfather from Ireland and a couple of lodgers who she had to cook for,12months later they got a back to back house in Nechells I/8 Inkerman St. where my brother John was born. Norman and Joe moved in as they were living in hostels at the time. Me, John, Joe and Norman slept in the attic room until Norman joined the army and Joe got married. My Nan Rose died age 61 in 1977 of a perforated ulcer. In the early 1900s, epileptics in the Workhouse were segregated into a male and a female ward, and were apparently never allowed out. My mother, then Miss Winifred Turner, undertook to organise occasional concerts for their entertainment. My father was a member of an amateur group, The Victorian Concert Party, which went to the Epileptic Wards, probably in 1901, to give a concert for her. They already knew one another by sight, as she was a member of Francis Road Congregational Church, Edgbaston, and he had previously been in the choir there, but they had never spoken to each other until that evening. It took them until 1908 to get married, as she turned down his first proposal. He proposed again later and was accepted, and they were married at Francis Road on 25 July 1908, when he was 30 and she was 29. They had a long and happy marriage, had three children, and lived to celebrate their 40th anniversary. If you wish to use any of this information you may do so. I have a letter somewhere from a Workhouse official, thanking my mother for organising these concerts, but I should have to search for it. My father worked at Summerfield Hospital many years ago, he worked on the maintenance side and believe he also looked after the boilers besides doing minor repairs etc. Because it was shift work he had to work some weekends and on the odd occasion I would go with him. Being Sundays he would not have to do a lot and he would show me around the place, there were a few derelict building on the site and one he took me in was a bit scary for a lad as young as I was at the time. It was very much like prison of some sort with lots of cells on two or more floors, in a room dad showed me some old books like registers with the names and details of people in them. I think it must have been part of the old workhouse. In the grounds of the hospital was a canteen and some young lads used to sit in wheelchairs outside if the weather was fine. The young lads had the largest heads you could ever imagine I think it was caused by hydrocephalus. This was another scary experience for me the first time I saw them. Dad gave me some money sent me into the canteen for some ice creams for those poor lads. He told me to take the ice creams to the lads saying they won't hurt you. I did as he said he followed me and we helped them take the paper of the ice creams and stayed with them for a while. Dad told use a few tales about the hospital and one I remember him telling us was rather funny. One of his workmates would never go to the mortuary on his own and insisted my dad should go with him. Well one day there was a job to be done in the mortuary so they both went. While the other fellow was doing the job dad was reading the tag tied to the feet of a body that on a trolley, the other fellow was horrified what would you do if he jumps up he said. Dads reply was I've got a good start on him his feet are tied together. My Mom died when she was 24 years old, she wasn't insured so she was buried in a Paupers grave at Witton, who would think of insurance at that age. She left three of us kids to be bought up by our Dad. I was then nearly three years old, my brother was two and my Sister was just three months old. My Gran bought up my Sister and Dad remarried. Dad was a Busker during the 20’s and 30’s, he had a lovely “Tenor” voice and could sing any of the Tunes of the day, he was busking the night Mom died. One day, he had done really well; he was sitting in the Market counting the money out of his hat when one of the traders accused him of stealing the takings from his stall. Well, Dad was on the UAB at that time and should not have been making any money, so, when I was about four years old, Dad was put down for three months and us kids along with our new Mother were sent to the Workhouse. This was about 1927; I remember my Stepmother had to scrub Rooms on her hands and knees to earn her keep. All I can recall is that I hated the Margarine they spread on the Bread, it had a green tinge to it and it tasted rotten. The best day of my life back then, was when we were allocated Free School Dinners at St Georges in Hockley (yes we did flit about a bit). But that’s another story. UAB,Unemployed Assistance Board (on the Parish). The Board would assess you and help you out financially with either cash or food/clothing coupons.